Legazpi City, Albay is one of the Bicol Region’s top tourist destinations. It is where the Mayon Volcano, one of the Philippines’ most famous volcano is located. Mayon Volcano is the Philippines’ most active volcano and is considered to be the world’s most perfectly formed volcano for its symmetrical cone. From the time I booked a ticket to Naga, I asked my cousin to join me on a tour to Legazpi. I researched online on places to go in Legazpi. I was thrilled that there are great places to view Mt. 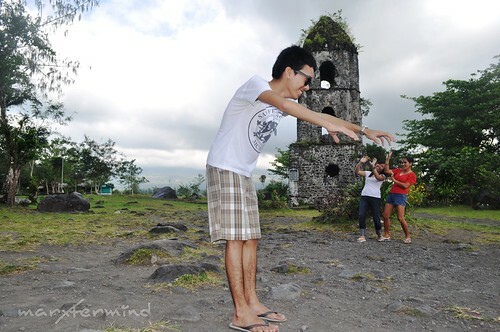 Mayon and I was so excited to take shot on it. Since my cousin is a local from Bicol, I didn’t bother to research on how to get to the tourist spots of Legazpi. I just gave her the places I wanted to go to and she will take care of it. This is going to be different, me travelling without detailed itinerary of my own, no time to think of and definitely not a tour guide of the group. At 7:00 AM, we left our house and went to Crossing Bula to meet EM, cousin, our tour guide! We arrived at the Crossing Bula around 8:00 AM, and after a couple of minutes EM arrived. From there, we rode a bus going to Legazpi City. We asked the driver to drop us at the Cagsawa Ruins. The fare costs PHP 100.00 with approximately 1 1/2 hour travel time. From highway we still need to walk for about 1KM to get to the Cagsawa Ruins but we opted to ride a tricycle. It’s my second time here. The first one was when I’m still a kid. By the way there’s an entrance fee of PHP 10. Em told me that it is far different now from the last time she came here. Though the belfry of the Church was still there, and Mt. Mayon…. missing! In February 1, 1814, Mt. Mayon began its most violent and deadly eruption to date. During the eruption, some 1,200 people took refuge in the stone church of Cagsawa. Unfortunately, all perished when lahar and pyroclastic flows engulfed the church. Only the belfry of the Cagsawa church remains as a grim and silent reminder of that fateful day. 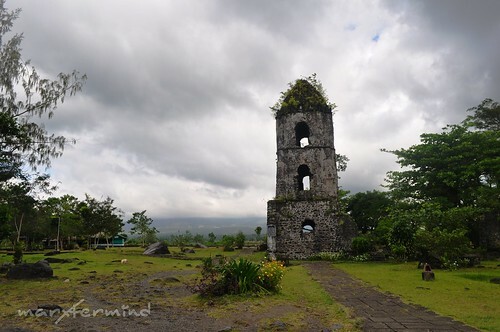 For almost two hundred years, it has withstood the test of time and the elements to become one of the most recognizable landmarks of Albay Province. Today, the site of the Cagsawa ruins is now a park managed by the municipal government of Daraga. It is actually the most visited tourist spot in the town. 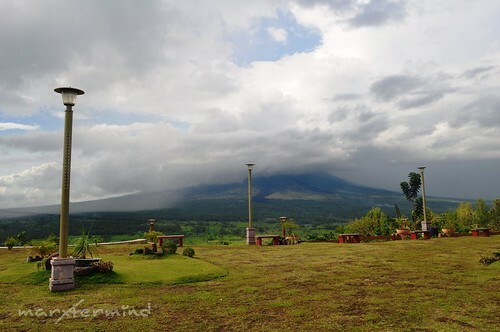 Visitors can enjoy the classic postcard view of Mayon Volcano with the Cagsawa belfry in front. Aside from the ruined belfry and the huge volcanic boulders around the area, visitors can also find several souvenir shops offering a colorful assortment of native products such as handbags, mats, shirts and handicraft made from indigenous materials like abaca. Exotic flowers and orchids are also on sale. And here’s our take with the shot maker. It was called The Giant! The photographer told us that Mt. Mayon showed up hours ago at 6:00 AM. And she added that Mt. 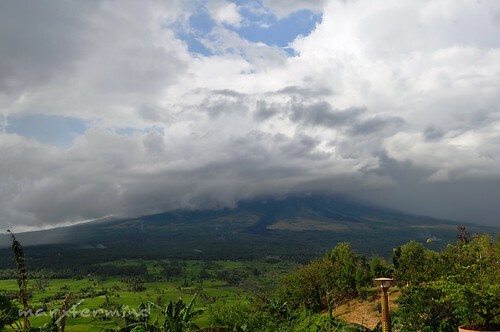 Mayon is usually seen during 6:00 AM and 6:00 PM and was always behind the clouds during the day. So after waiting for an hour for Mt. Mayon to show up, we left the Cagsawa Ruins and moved to our next destination. From the Cagsawa Ruins, we walked 10 minutes until we reached the high way. And from Highway, we rode a jeep going to Legazpi City. Since it’s already 10:30 AM, we’ve decided to go to Embarcadero first to have our lunch. The city has developed and grown from the last time I visited it. There are more establishments now and population has grown. 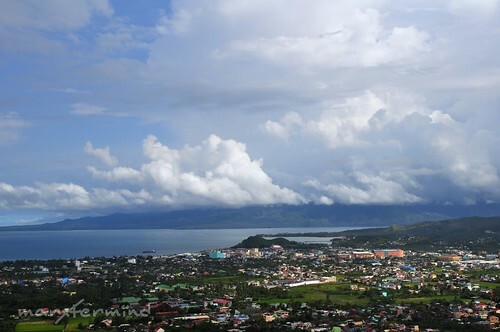 Legazpi City is indeed the largest city in the Bicol region in terms of population. 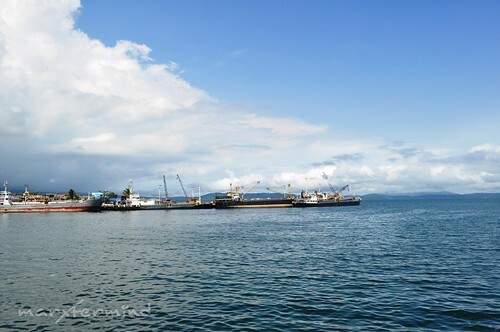 Embarcadero is a major waterfront development in the Legazpi City which is now one of the famous tourist destination in the city. 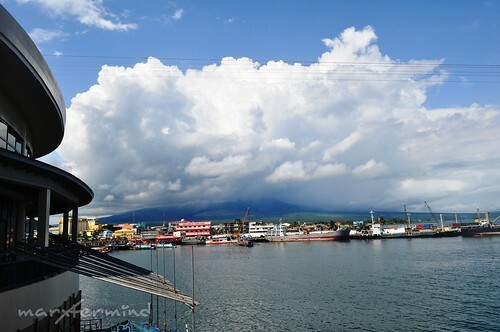 The site fronts the main harbour of Legazpi with views to the Mount Mayon volcano. Embarcadero functions as a waterfront promenade, with theatrical lighting and performance spaces creating a lively, family friendly environment during the day and at night. Embarcadero reminds me of Ayala Malls. 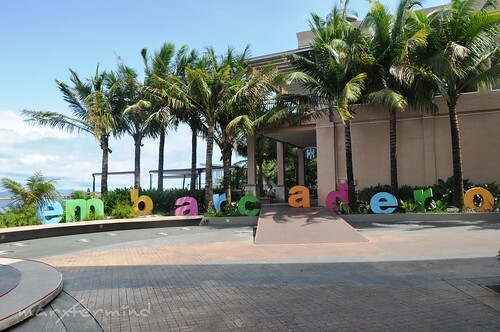 Aside from dine and shop, Embarcadero offers a lot of adventures. There’s the zipline and the go kart. I was thrilled when I saw the zipline since the ride will start at the lighthouse down to the other end at the breakwater. But unfortunately, it was closed that day since all of the staff are in Misibis Bay for some company activity. Well, failed zipline, failed Mt. Mayon… I guess I need to come back here. Embarcadero de Legazpi is a new addition to the progressive city of Legazpi. 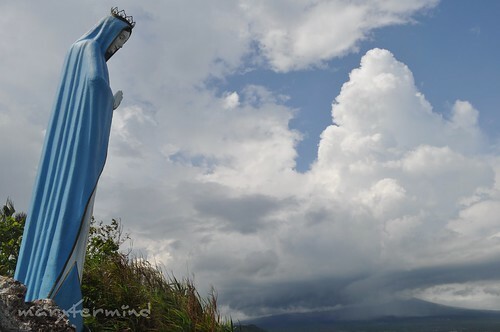 Be sure not to miss this one when you tour around Legazpi. At 2:00 PM, we left the place and moved to our next destination, Our Lady of Guadalupe Shrine. When I told this one to my cousin, she was unaware that there is such place in the city. Mabuti pa daw ako alam ko! Yan ang nagagawa ng internet. They take you to places! The shrine is situated at the top of Buraguis hill looking over the city proper. From Embarcadero, we rode a tricycle going to Buraguis. Fare costs PHP 60.00 with 20 minutes travel time. The driver asked us if where will be our next destination after this since there were no regular tricycles there, so he offered himself to fetch us at the shrine and will take us to our next destination after this. He gave us his number and told us to text him if we are about to go. It is an uphill. 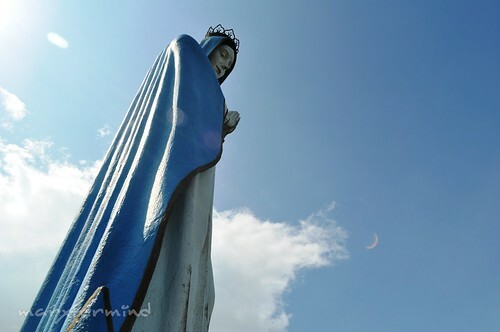 There are life-sized depictions of the stations of the Cross arranged at the slope of the hill and at the top is the 20 feet image of the Virgin of Guadalupe. When we got there, there are no people around except for us. The view from the top is so relaxing, looking over the city. The shrine is closed so we just took our seat at the bench and nourished the view from the top. I tried to take a shot alike from the picture I saw online wherein the Virgin of Guadalupe is looking over the city proper with the Mt. Mayon from afar. It was really hard since it was a bit scary to get up from the summit. I placed myself everywhere just to take that picture, and after awhile I already figured where should I need to take that photo. If you could just imagine kung anong pwesto ko when I took the picture (nakaupo sa bato, and wrong move hulog ako). And here’s what I’ve got. I was disappointed since I was really hoping that I could get this picture with Mt. Mayon from afar. But there’s still next time right, I hope Mt. Mayon wouldn’t be shy next time that I’ll be here. Afterwards, we sent a text message to the tricycle driver that we were about to go. After 5 minutes the driver arrived and we’re all set to our next destination, Ligñon Hill. From Buraguis, it took us 30 minutes to go to Ligñon Hill. The driver charged us PHP 80.00. 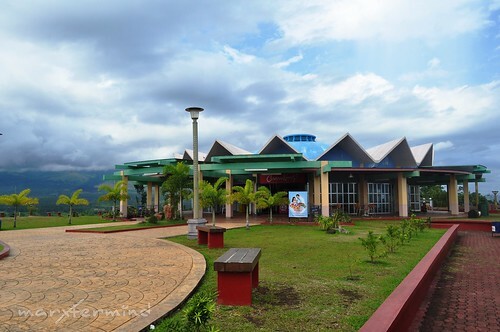 The hill is one of the well-known landform in the city located behind the Legazpi Airport Tower and beside the Albay Wildlife Park. The hilltop is accessible through a scenic concrete road that winds up the hill offering a challenging 20 minute trek. But if you don’t want to walk uphill, there are motorcycles from the hill entrance that will take you uphill, PHP 20.00 per person. By the way, we paid an entrance fee of PHP 20.00. The summit offers a breathtaking view of the City of Legazpi, the deep blue Albay Gulf, nearby towns and islands, and the majestic Mt. Mayon. And the Mt. Mayon still behind clouds. By the way, there’s a zipline at the hilltop that costs PHP 250.00. There are also stalls that sell souvenirs and also some restaurants. We grabbed some halo-halo for refreshments. Init kasi! And just enjoy the view from the top. From Ligñon Hill, we rode a tricycle going to Albay Pilinut Candy Shop. I’ve read from the internet that this shop is famous for Bicols’s delicacy, Pili! The shop is located at the Old Albay dsitrict, Legazpi City near AGO General Hospital. Established in 1936, Albay Pilinut Candy is the first pili nut candy factory in the Bicol Region. Today, Albay Pilinut Candy continues to serve high quality confections and candies made from Bicol’s famous pili nut. It remains a family business, giving its products that distinct quality and taste that makes people coming back for more. Their products are pricey compared to those in the market. But I must admit that the brand and packaging are really impressive. I bought some Roasted Pili, Pastillas de Pili and Pilinut Choco for pasalubong. I’ve tasted the Pastillas and Pilinut Choco and they were good (kaya lang pricey). This was our last stop. We’re tired and we’re about to hit home. We rode a jeep going to the terminal. 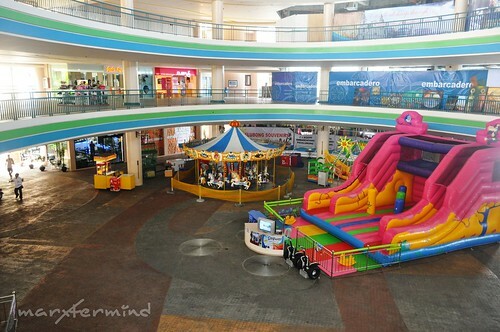 The terminal was near Gaisano Mall. And from there we rode a van going to Naga. The best time to view Mt. Mayon is at early sunrise and before sunset since the volcano is always hiding behind clouds during the day. There are still great places to go to Albay. You may check out the sites provided below. If you have still time and have another day to spend at the Bicol Region, try to go to Donsol for whale shark encounter or at Misibis bay to experience the luxurious vacation. Enjoy! Next story Something Local: My Bicol Food Trip! @poot, dito sa Manila pero may relatives ako sa Bula! Nakakaintindi ako ng Bicol pero di na ako fluent magsalita. Nung bata ako marunong ako! Hahaha! @Christian, oo ang kulit nga! Hehehe! You're from Bicol too Kuya Max? Coool. Asen ika naka-istar? Haha. You understand Bikolano? Anyway, I'm from Oas. But I'm staying in Tabaco 'cos of my studies. 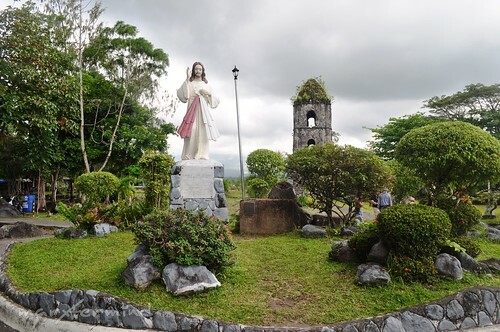 Ngayon ko lang din nalaman na may shrine in Buraguis. Thanks for the info. @khantotantra, thanks! Yung photographer nakaisip ng pose! Galing nga eh! Hahaha! ganda ng shots lalo na yung parang monster kunwari. @Chyng, Thanks its a compliment! Buti ka pa, ako nakita ko sya sa bahay namin kaya lang ang layo sana next time makita ko! anton and I are discussing na iilan lang na nikonians ang shots na naappreciate ko. kasama ka dun. ang linis. not overly saturated and hard cored edited. keep it up! @Kura, Oo nga eh, babalik ulit ako sa Legazpi pag may time and buget na ulit! Maganda sa Bicol! Punta na! Hehehe!